Every argument contains a few propositions which act as a base. But there are some propositions, an author deliberately leaves as they are obvious to the reader. For example, If A suggests B to go to ENT specialist as B is suffering from Throat infection, A assumes that a specialist doctor may diagnose better than normal physician. 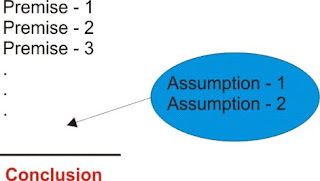 So an Assumption is an unstated premise. In finding assumption to any question, we need to search for the reason which gives strength to the argument and without which the entire argument may not hold good. Note: Always remember, Assumption is an unstated premised from the author point of view which may not be true for the reader. For example, A suggests B, Let us go to XYZ movie, as Mahesh acts in that. Here A assumes if Mahesh acts in a movie, they are worth watching. But from B point of view, It may not be true. Directions : In each question below is given a statement followed by two assumptions numbered I and II. 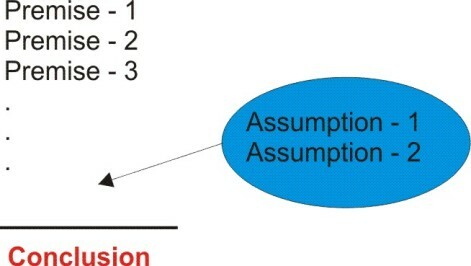 An assumption is something supposed or taken for granted. You have to consider the statement and the following assumptions and decide which of the assumptions is implicit in the statement. Give answer (a) if only assumption I is implicit; (b) if only assumption II is implicit; (c) if either I or II is implicit; (d) if neither I nor II is implicit; and (e) if both I and II are implicit. “ A taxi is required on rent.” - an advertisement. b. The statement says that a taxi is required on rent. It does not say that any vehicle is required. So the statement cannot be said to have assumed that any vehicle is available for rent. But II is obviously implicit; whenever an advertisement is made it is assumed that people will respond to it. I. No other company supplies pure ghee. b. I is definitely not mentioned in the advertisement. II is implicit, otherwise Company ABC wouldn’t have given the advertisements. Of all the TV sets manufactured in India, ‘XYZ’ brand has the largest sale. I. The sale of all the TV sets manufactured in India is known. II. The manufacturing of no other TV set in India is an large as ‘XYZ’ brand TV. a. Unless the sale of all TV sets manufactured in India was known, the statement could not have been made. Hence I is implicit. II is not implicit because we do not know about manufacturing; we know only about sales. XYZ brand has the largest sale but it may not be the largest manufacturer of TV sets. May be Y company manufactured more sets than XYZ does but it exports all its sets. In that case Y is a bigger manufacturer but its sale in India would be lesser than that of XYZ. I. Gopal wishes to go to Tirupathi. II. Ram gives advice to everybody. a. Unless Gopal would be going to Tirupathi, Ram would not have advised him this. Hence I is implicit. But it is not certain that Ram gives advice to everybody. Maybe Ram is giving advice to Gopal because Gopal is Ram’s friend. Cricket matches have become indispensable for the entertainment of people. I. Cricket matches are the only medium of entertainment. II. People enjoy Cricket matches. b. Cricket matches have become indispensable but it does not imply that they are the only medium of entertainment. But it is certain that people enjoy Cricket matches. Hence II is implicit. “Do not lean out of the door of the bus.” - a warning in a school bus. I. Leaning out of a running bus is dangerous. a. Leaning out of a running bus must be dangerous, otherwise the warning would not have been there. Hence I is implicit. But II is not implicit. If the authorities would have assumed that children do not pay any need to such warning, they would not have put it up there. “If you are a software engineer, we want you as our programmer.” - an advertisement by company XYZ. I. Software engineers are expected to be better performers by company XYZ. II. The company XYZ needs programmers. b. I is not implicit. The company wants software engineers. One reason could be that the company expects software engineers to be good performers, as I suggests. But there could be another reason: for example, the company’s programmer job could be such that only a software engineer could perform it. But one thing is certain. The advertisement was for programmers; this means programmers are needed. Hence II is implicit. Be humble ever after being victorious. I. Many people the after being victorious. d. The statement asks a man to be humble ever after being victorious. This implies that people are usually not humble after victory. I is just the opposite of it. II is not implicit because it generalises the statement. Generally, people may be humble; the point is if they are humble or not after victory. I. If not clarified, all the candidates may claim reimbursement of expenses. II. Many organisations reimburse expense on travel to candidates called for written examinations. e. If the letter mentions expenses to be borne by candidates, those who sent the letter must have assumed that the candidates may demand for reim-bursement if the point is not clarified to them. Also, the candidates would not demand reimbursement if it was not a prevalent practice. So I and II both are implicit. One of the opposition leaders said that the time had come for like-minded opposition parties to unite and dislodge the corrupt government. I. Like minded opposition parties should unite only when they have to dislodge a corrupt government. d. To dislodge a corrupt government has been mentioned as the present purpose for the call of unity. But this does not mean that this is the only purpose. So I is not implicit. Further, the leader asks like-minded parties to unite against the government and not the entire opposition. So we cannot generalise that (all) opposition parties are non-corrupt. Hence II is not implicit. Bus charges have been increased to meet the deficit. I. The present charges are very low. II. If the charges are not increased, the deficit cannot be met. b. Bus charges have been increased. The cause: to meet the deficit. This never means that the present are low. If the price of goods increase, it is not necessary that the earlier price was low. But the tone of the statement clearly implies that Bus charges have been increased out of compulsion: so II is implicit. If degrees are de-linked from jobs, students will think twice before joining college. I. Students join college education to get jobs. II. A degree is of no use in getting a job. a. The statement says that if degrees are delinked from jobs, students will not join colleges. This implies that jobs are a major reason for them to join college. So, I is implicit. Now, if I is implicit, II is not because II is just the opposite of I.
I. A good educations system is essential for the well-being of a nation. II. A good education alone is sufficient for the well-being of a nation. a. The statement uses a tone that implies that if education is in a shambles, then the country deteriorates. This means that a good education is needed for the well-being of a nation. But this does not mean that a good education alone is sufficient for it. So, I is implicit but II is not. The next Annual general meeting of the Company will be held after one year. I. The Company will remain in function after one year. II. The Governing Board will be dissolved after one year. a. Obviously, the author assumes that the Company will be functioning after one year, otherwise he would not have fixed the date of the meeting one year later. But there is no hint that the Board will be dissolved after that. So I is implicit, II is not. I. Learning computers is easy. II. Computer educations fetches jobs easily. a. If one says that computers should be taught at schools he must have assumed that it is an easy subject, because schools are a place of elementary education; tougher things are taught at colleges. But the statement does not say anything about jobs. So I is implied, II is not. The new education policy envisages major modifications in the education system. I. Present education system is inconsistent with national needs. II. Present education system needs change. e. If major modifications are being envisaged, it must have been assumed that the present educational system is inconsistent with what the nation needs. So I is implicit. Again, if I is implicit, II also is, because II says the same thing as I.
I. Institute Y provides good Management education. II. Krishna listens to Sriram’s advice. e. If Sriram advises Krishna to join a particular institute, Sriram must have assumed that the particular institute was a good institute. So I is implicit. While advising Krishna, Sriram must also have thought that Krishna would listen to Sriram’s advice; so II is implicit. “Drop this letter in the letter in the letter-box on your way to school.” - A mother to her daughter. I. The child knows the address of the person to whom the letter is being sent. II. The child will comply with the orders of his mother. b. The mother only asks her son to drop the letter. I would have been implicit if she had asked her son to drop the letter and write the address also. But II is implicit. Had the mother not assumed that her son would comply, she wouldn’t have asked him to do the job. Everybody loves reading romantic stories. I. Romantic stories are the only reading material. II. Nobody loves reading any other material. d. People love reading romantic stories but this does not means that they have nothing else to read. Nor does it mean that they do not like to read anything else So, both I and II are not implicit. Read this notice before entering the office. I. People coming to the office are literate. II. No blind person comes to the office. e. When some says “read this notice” he must have assumed that the other person can read. This would be possible only if the person is literate and not blind. So both I and II are implicit.